You’ve seen Marty on TV. 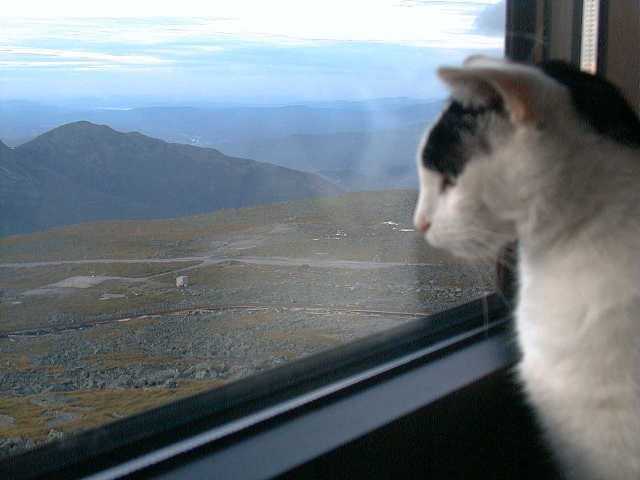 And you’ve probably seen or heard of Inga and Nin, the other famous Mount Washington Observatory cats. Don’t forget Jasper, a shy, seldom-seen orange cat who lived with them on the windy summit of New England’s highest peak. An excerpt from Life at the Top, by Eric Pinder. New summit cat Marty’s dark fur and constant motion make him a challenge to photograph. Illustration © T.B.R. Walsh from the picture book Cat in the Clouds. I first met Jasper the cat on a chilly evening when westerly winds were whipping across the summit at seventy miles per hour. I stood alone on the mountaintop and watched a dark fist of cloud punch slowly toward the peaks, beaching itself on the rocks. Gray mist splashed on the boulders like ocean spray. As I stumbled through the fog, bullets of hail nipped at my face, and the hood of my jacket flapped like a sail. With each strong gust, the precipitation can I was carrying squirmed in my arms like an angry cat. I encountered a truly angry cat back in the shelter of the observatory. Jasper was not a happy animal when I rudely walked in from the cold and picked him up; I even had the nerve to try to pet him. He squirmed and struggled in my arms until I let him go, but graciously accepted a bowl of milk as a peace offering. He even begged pitifully for a second peace offering two minutes later. “Is Jasper an outdoor cat?” I wondered aloud. For fourteen years, Jasper has survived inside the warm belly of the Mount Washington Observatory while sleet and hail battered the windowpanes and hurricane-force winds rattled the walls. Outside, sheets of ice rain have shattered on the rocks like glass, but a snoozing Jasper has purred through it all. Like most cats, Jasper is a hunter. One night, he trotted off into the twilight and jogged back with a mouse tucked between his jaws. He deposited his prize in the doorway and ran back for more. By night’s end, a row of rodents lay scattered across the observation deck, sorted by size. Everyone was surprised. “He was stacking them up like cordwood,” announced one early riser. We expected the Environmental Protection Agency to show up any minute to delcare the American house mouse an endangered species. What’s so odd about an orange tabby cat who lives on a mountain and likes to eat asparagus? In Jasper’s case, quite a bit. He often flees in terror from children but tolerates adults, so long as they hold him upside down (he hates being held right-side up) and put plenty of milk in his drinking bowl. A rare photo of Jasper and Nin together on the summit, circa 1996, when Jasper was the old-timer and Nin was just a rookie. 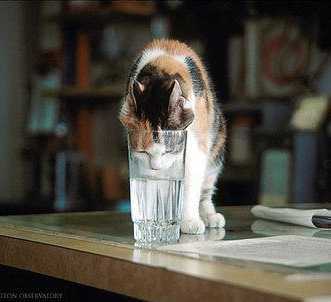 For more than a decade, a traumatized Jasper played second fiddle to Inga, the famous calico cat with frosty whiskers. Inga was always the teacher’s pet, the spoiled child. 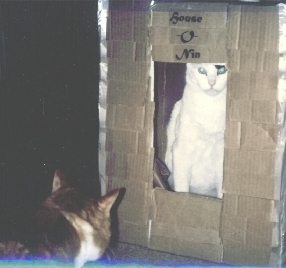 A darling of the media, she was “interviewed” by Cat Fancy magazine while a jealous Jasper sulked in obscurity. A picture of an icy Inga is still printed on T-shirts, posters, postcards, and refrigerator magnets that are sold each summer in the Mount Washington Museum gift shop. When Inga passed away in 1993 at age nineteen, her estate generously donated all proceeds from her modeling career to the Observatory. Photo of Marty © Mount Washington Observatory, from the second edition of Eric Pinder’s book Life at the Top. Sadly, Jasper has enjoyed no such notoriety. While thousands of Inga postcards are shipped to mailboxes all across the continent, poor Jasper lurks in the shadows, far from the public eye. Even worse, a new nemesis named Nin appeared on the scene in 1996, just when Jasper finally thought he had the summit to himself. (Rumors to the contrary, Nin’s name is not short for nincompoop—though it should be!) Nin poses for the cameras and purrs in the arms of visiting journalists. He also robs Jasper’s food bowl when the older cat isn’t looking. January 2008. Poor Jasper. He just can’t win. Nin has gotten older but no less famous. He’s now living with two Mt. Washington State Park rangers down in Gorham, New Hampshire, much closer to the vet’s office. When Nin retired from the summit the day after Christmas in 2007, there was a flurry of internet activity and a surge of “hits” on this page in particular. 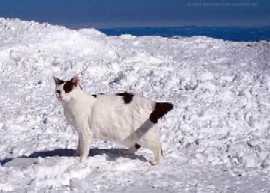 Apparently everyone was Googling “Mount Washington cats.” It made me curious enough to look up the keyword statistics. 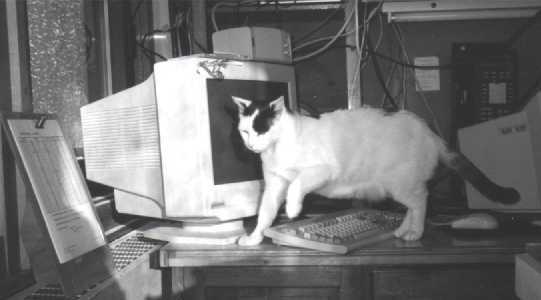 I found plenty of searches for “nin the cat,” mt washington cats,” “inga mt washingon,” and similar variations. But there wasn’t a single search for poor old Jasper. At first I couldn’t even find a picture of Jasper close at hand as I was putting together this page. Inga died in 1994, and Nin is no longer on the summit, but they’re both still the limelight. 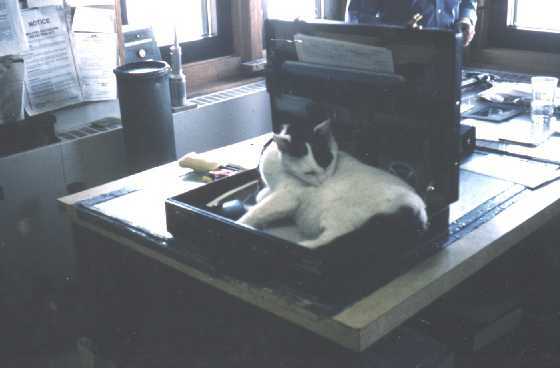 The tradition continues as a new Mount Washingon cat named Marty moved up to the summit in January 2008. Checking the statistics in January 2008, I noticed a keyword search for “marty nin cats.” Marty the cat had only been on the summit for a few days and he’d already been Googled more often than Jasper ever was. It looks as if Marty will continue to walk in the pawprints of his photogenic predecessors, Inga and Nin. July 2009. Sad news today, as Nin passes away. Nin was New Hampshire’s “other” Old Man of the Mountain, and just as much an icon. You’ll never meet a friendlier, funnier or more photogenic cat. Nin (pictured with co-author Eric Pinder) jumps for a treat in the Observatory kitchen. No one’s sure exactly how old Nin was, since he showed up as a stray at the home of one of the summit crew back in 1995. Our best guesses are that Nin was somewhere between three and six years old when he first came to the summit, where he watched ravens, had staring contests with the fox, hiked across boulders, purred in laps, and patiently sat at the edge of the Scrabble board watching the crew play for the next twelve years. Later he retired in comfort to the valley home of two Mt. Washington State Park rangers for another year and a half. That would make Nin somewhere around 17-20 years old. One thing’s certain. We miss you, Nin.